Trigs or Triggs? What's in a name. Anyone not from SA, this is gonna bore the crap out of you. Probably most South Oz surfers too. When we launched the Trigs surfcam on the SA Mid Coast, it was called Triggs - that's just the way I've ever know it to be spelled. 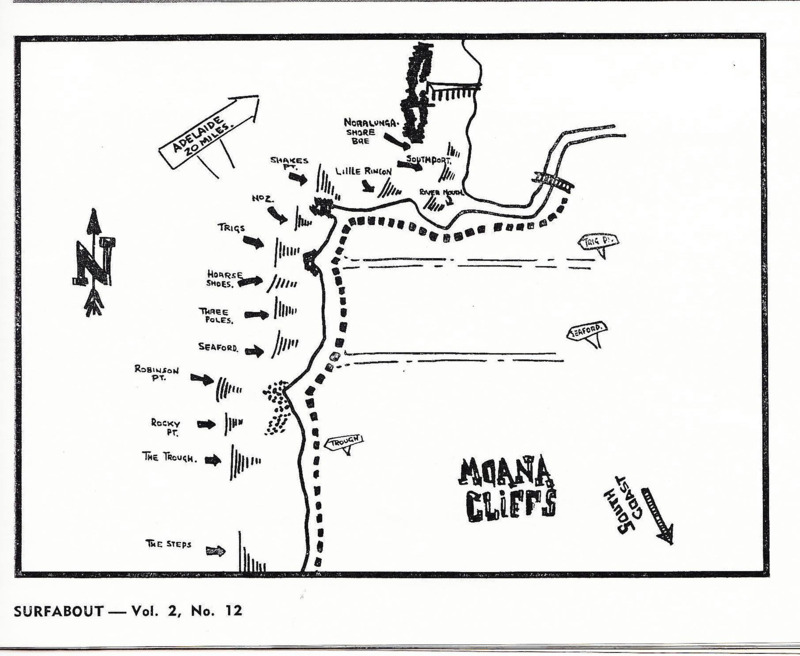 I was then very quickly petitioned by a couple of local surfers, who politely but enthusiastically asked me to change it to 'Trigs' (with one 'G'), supplying me with supporting information (the map below is from John Arnold, in the 1964 Surfabout). 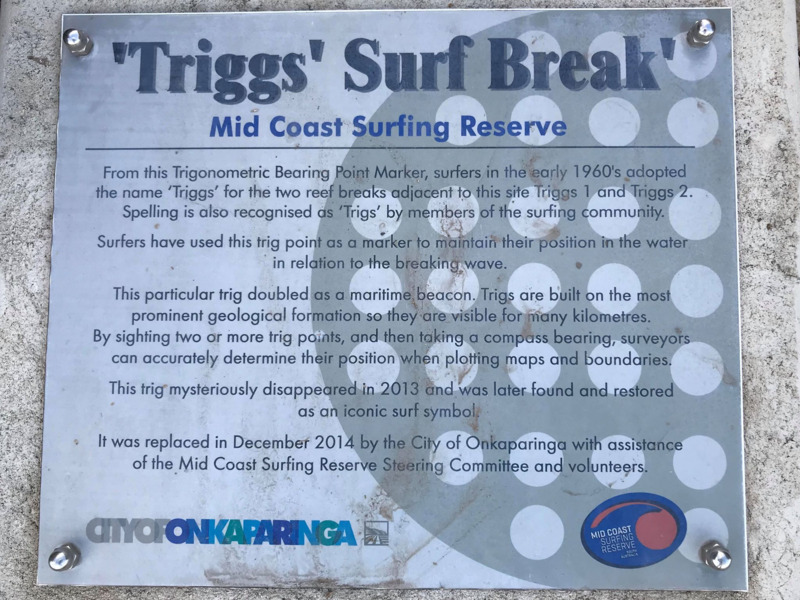 Anyway, I've since been contacted by the Mid Coast Surfing Reserve committee, who have asked me to change it back to two G's, because, well, they have a plaque now that has two G's on it (though the plaque also says "Spelling is recognised as 'Trigs' by members of the surfing community"). What to do! It's such a dilemma. Also, next time I'm in South Oz I'm gonna surf a few new spots: Robinson Point, Rocky Point and The Steps. If you think about it, 'Mid' is a derivative of 'Middle' so if you don't mind I'm gonna call it the Midd Coast from now on. Just jokes , Craig. I’m pretty sure I’ve never surfed there , if so I can’t remember it. Surfed robe once , that I know. Even that memory is a little hazy . Does a million duck dives over a very wide shallow sand bank that breaks twenty lines of whitewash out to sea in brown water sound correct for that area ? Slow , shallow incline waves ? Whoops , just checked. I think that’s on the other side of the peninsula. No need to apologise, there's a winki face hidden there. Ah that sounds either like Browns beach down Port Macdonnell way, Long Beach or Middleton. All very average but on the right board and on their day fun.. I'm surprised a group of surfers asked you to change it in the first place. Trigonometric Points are just that. 100's exist over Oz..some still retain Trig name. Flagstaff Hill is another generic title given to pilot's quarters that rise to Trig points. When it mattered (eg: 1970's) to apply a lick of paint to relenting Sign- [Trig'g St]. Councils then have reason to nameTrigg Park/Beach after Pioneering Servants. This in turn gives a warmer more localized defendable daily spelling of Trigg. Whereas visiting folk from afar continue to embrace heritage Trig Point/s. I think one g makes more sense. It's not "Triggonometric". We outsiders stick to the letter of the Law. I researched further & can establish a set pattern. Trig as in Trigonometric Name applies to all Coastal Point's/Roads/Tracks. Short of pinpointing a dominant Trigg presence at Trig/g/s we can rule that out. As I said we outsiders can now re-apply the letter of the Law G or GG. Answer: There are no village idiots and outta towners need only dig a little deeper. Trig Point is still there & it's very real indeed. Triggs Beach lies beneath & is also very real & Yes that's the beach's proper name. Triggs Surf Break lies off the Shore of Triggs' Beach in the shadow of Trig Point. Here's how it all comes together! So simple that only surfers could understand. Trig Point pushes out several breaks called Triggs accessed from Triggs' Beach. Trigg's Stretch...(Horse Shoes > Southport > Adelaide). There's a Trigg St in Port Elliot, near Boomer's.